Chicago Bridge and Iron Co. is planning to spend an additional $8 million to expand its facilities in Pascagoula, Miss., for the con- struction of large offshore oil rigs and equipment. Robert Hicks, production man- ager in Pascagoula, said the com- pany has already spent $3.5 mil- lion on expansion and expects to increase employment from 135 to 500 by early 1982. Thomas W. Burke, president and chief executive officer. Hartford, Conn., offers a four- page brochure describing and il- lustrating its line of shipboard lighting products. The company claims to have originated the electronic strobe water light more than 20 years ago. In addition to the strobe man- overboard lights, the brochure lists automatic barge lights, flash- ing marker lights, and steady lights. A separate data sheet de- tails the company's new personal flotation device (PFD) lights, which the Coast Guard now re- quires for all U.S.-registered com- mercial vessels on oceangoing, coastwise, and Great Lakes voy- ages. The Reagan Administration im- plemented its coal export devel- opment policy when a high-level interagency working group met for the first time recently to tackle obstacles to U.S. coal ex- porting. States' role in world energy eco- nomics." Administration's economic recov- ery program," Secretary Baldrige said. Morris Jr., named earlier as chair- man of the new interagency group and chief Administration spokes- man on coal export matters, said the group would "move aggres- sively to make this nation the preeminent source of coal on the world energy market." 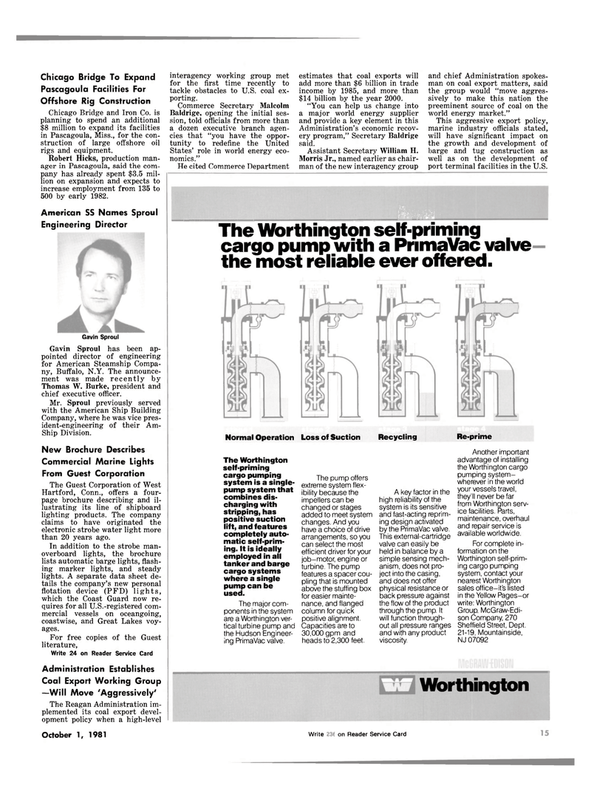 The Worthington self-priming cargo pump with a PrimaVac valve the most reliable ever offered. The Worthington self-priming cargo pumping system is a single- pump system that combines dis- charging with stripping, has positive suction lift, and features completely auto- matic self-prim- ing. It is ideally employed in all tanker and barge cargo systems where a single pump can be used. The major com- ponents in the system are a Worthington ver- tical turbine pump and the Hudson Engineer- ing PrimaVac valve. The pump offers extreme system flex- ibility because the impellers can be changed or stages added to meet system changes. And you have a choice of drive arrangements, so you can select the most efficient driver for your job-motor, engine or turbine. The pump features a spacer cou- pling that is mounted above the stuffing box for easier mainte- nance, and flanged column forguick positive alignment. Capacities are to 30,000 gpm and heads to 2,300 feet. A key factor in the high reliability of the system is its sensitive and fast-acting reprim- ing design activated by the PrimaVac valve. This external-cartridge valve can easily be held in balance by a simple sensing mech- anism, does not pro- ject into the casing, and does not offer physical resistance or back pressure against the flow of the product through the pump. It will function through- out all pressure ranges and with any product viscosity. Another important advantage of installing the Worthington cargo pumping system- wherever in the world your vessels travel, they'll never be far from Worthington serv- ice facilities. Parts, maintenance, overhaul and repair service is available worldwide.